Today, Woodlore continues to advance, leading the field which it pioneered. A small team of passionate and dedicated professionals work hard to provide the highest standard of tuition and leadership in wilderness bushcraft, whilst striving to extend our sum knowledge and understanding of this wonderful subject. In addition to Bushcraft training, Woodlore has evolved to also provide some of the finest outdoor clothing and camping equipment, carefully selected on the basis of our extensive experience. This move was not a commercial choice, but arose after a student attended one of our Arctic expeditions having been mis-sold a summer sleeping bag instead of an arctic bag, and represents our philosophy of making the wilderness experience accessible safely to all. It is our firm belief that Wilderness Bushcraft has something of value for everyone; hopefully this is reflected in our programme of educational courses that has evolved over the thirty years we have been operating. At Woodlore, course development is a never-ending process as we endeavour to bring the subject to a wider range of student. Wilderness Bushcraft encourages us to a much greater cultural tolerance and to notice more keenly our effect upon the world. We believe that this ancient outdoor knowledge is most important to our futures. As realists, we do not hold to any restraining dogma, but accept the arrival of new technologies while tempering their use with more ancient wisdom. After all, who is the better prepared hiker - the one with the global positioning navigation device or the hiker who can use the new equipment but can also rely on their ability to read natures signs for direction? In truth, the older skills enhance the most up-to-date while the newer skills simply validate the knowhow of our ancestors. 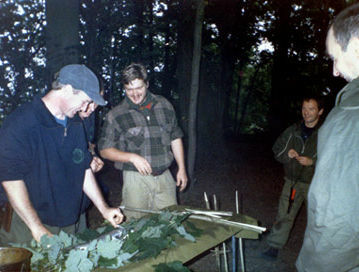 As you will soon realise, bushcraft is the art of the possible. Woodlore are proud to now be supporting Children with Cancer UK as our chosen charity as a corporate partner to help children battling with childhood cancer.